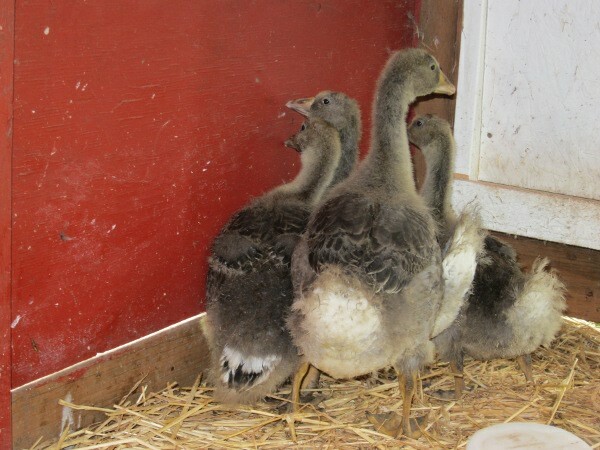 Some friends gave us four Toulouse geese on Sunday. We are very excited to add them to our place! Geese can live only on grass, which is a big advantage as grain prices rise. We eventually hope to use them as a meat source as part of a rotational grazing system. In the shorter term, they will be mowing the grass in our orchard. At the moment, they have PTSD from being separated from their flock, so they are locked in the chicken range shelter while they acclimatize to us and we build a new mobile range shelter for them. Your geese look like our ducks did — huddled together, always alarmed. I hope they settle in. I knew that RI Red didn’t seem right. lol I need to pop over your way and catch up on your blog too. Summer time is always so busy and then I find myself not hanging out on the computer as much. I hope the geese get over being scared me. There are so cute and fat looking. I will go out to watch them but it gets boring fast because all the do is huddle and refuse to move. I love the look of the toulouse geese but so far I haven’t been able to afford them. You are so lucky to have those given to you! I just couldn’t find any around here. The farm stores only sold mixes, I didn’t want a full order from the hatcheries, and I couldn’t seem to find any on craigslist. We were going to try eating goose last year to see if we liked the meat, but the only place that stocked it was 70 dollars and up for one bird. It was ridiculous. I do feel really lucky that we had some friends that let their geese hatch a few eggs for us. That’s awesome!!! I LOVE our geese (Toulouse, African, and a new White Chinese). We’re sending our first batch off to butcher this fall (hatched this spring from the geese we raised last year). Are you gonna keep all those given to you for breeding, or will you eat a couple this year? We will probably eat a couple. Since these geese are from the same parents we will need a different mate for the ones we keep. If we like how the meat tastes then I would love to just have a breeding pair who supplies each years crop of dinner. those are some ugly ducklings…if you decide to make some patê from them let me know cause I think I know somebody who likes patê and shipping that patê with the bacon you owe me will help cut down on shipping costs. They have become much prettier in the last 3 weeks. The patê is some ways off though. We still haven’t figured out what their genders are. We have 3 embden geese, that we got because we couldn’t find any toulouse this spring. So far I love having geese. They’re about 4 months old. Our are guard geese for the chicken and they do a great job. They haven’t actually stood up to predators, but they make a huge racket when they seen animals or people they don’t know. They’ll hiss at and bite people they don’t know who get too close. I’d recommend that both of you handle any that you want keep keep daily while they’re still young. They may never like it, but they’ll fight you less when you need to. They’ll also warm up to you faster once they trust you. I got whacked in the face by a wing today when my girl got scared because I moved her strange. It hurt but it would have been worse if she didn’t trust me. Be prepared for them to chew on anything! Strings, electric fence wire, drip system tubing, anything plastic doesn’t stand a chance around here. Hi Shannon! I feel like our farm is just getting started too, to be honest. There’s a never ending list of things to do. When we get all the pastures fenced in, maybe things will seem a little more official. We haven’t tried to handle the geese since we first got them. I suspect they would take issue with it, although it probably would make them easier to work with in the long run. I feed them some grain every morning, and they herd along in front of me just out of reach shrieking their chattering complaints about the emptiness of their food pan. I think geese are a lot more fun to keep than chickens, but it could be the novelty of them I suppose. I’m glad to hear that yours chew on everything as well. I thought ours just had some strange obsession with chewing on the poultry fencing. They also eat far more dirt than I expected, presumably for the grit. That’s pretty neat that you trained yours to go to bed. What we’ve read so far is that most geese only use their shelter for nesting, and will otherwise prefer to be outside even in bad weather. They have range shelter in their current pen, and they only enter it when I put food there. Sorry, pretty disgusting stuff here. You should probably make an effort to learn more about geese societal patterns, and seriously, to entertain the idea of producing foie de gras in this day and age is inexcusable. Starting with your reading comprehension! Whoever said anything about foie gras? You know there is more meat on a goose than just the liver, right? Do you think people buy whole chicken at the grocery store and then throw out everything but the liver? Furthermore, who has the time to chase their geese around with a funnel every day?